One of the questions often asked in the aviation world, right after 'Have you been to Oshkosh? ', is 'Have you been to Reno?'. I am delighted to say that both Alan and I can now say 'Yes!' to the latter! We decided to go partly for a summer holiday for Alan, and also it was the 50th anniversary of the races, so it ought to be good. And there was a bonus in that several pilots from the Sport Air Racing League (SARL) would be racing in the Sport class. Reno National Championship Air Races (as they are officially known) are held at Reno Stead airport and divided into six classes: Biplane, Formula One, Sport, T6, Jet and Unlimited Warbird. Each of these is subdivided into Bronze, Silver and Gold with the fastest aeroplanes competing in Gold. Pilots arrive on the Saturday before the races for check-in and spend the first part of the week qualifying. Some of the classes are oversubscribed so a few planes get knocked out. They can only fly nine planes at a time so spots are limited. The final races are flown on the Sunday, eight days after check-in. The races start early in the morning with the Biplane heats, followed by Formula One. They seemed to use rolling starts from the runway, unlike the other classes. A Formula One aircraft. See how tiny it is! These all use the same O-200 engine as found in a Cessna 150. They go somewhat faster, though. From Sport class upwards, the planes are led away from the airfield by a non-racing lead aircraft, and they form up in line abreast alongside this plane before coming down the Chute, which from our point of view brought them over the grandstands into the right hand side of the airfield, heading away from the crowd onto the racecourse. The guy on the left of the formation in the Chute is effectively on pole position as everyone else has to gather in to the course for the most effective flight line. If you are near a loudspeaker you can hear the starter say, "Gentlemen, you have a race!" They say "Fly low, fly fast, turn left!" around here and that is basically what you do. The racecourse is a left hand circuit around the Valley of Speed, with the start/finish straight being parallel to the grandstands, several hundred feet in front. The addition of the third dimension makes for interesting racing, although I am not sure of the exact rules for passing others. If it is anything like SARL rules then you have to pass with the other aircraft visible at all times, which puts you on the outside of the turn. One of the pilots said you need a 5mph advantage to pass but it wasn't clear if that was determined by rules or physics. One of the T-6 racers. It is also different from motor racing in that you can see the racers all the way around the circuit! No trees or hills or buildings get in between you and the aircraft (they don't fly _that_ low ;-) So you can follow the action all the way around which gets pretty intense. We spent a lot of time in the pit area. You have to buy a pit pass in addition to the main entry but it is so worth it, as that is where most of the action is. The pits are very accessible, even the big warbirds are right there in front of you with their big tents and trucks and T-shirt sales etc. Some of them have control centers and viewing areas on top of the trucks which is cool. There are rope barriers to stop folks just wandering in, but you can watch everything they are doing, all the engine works and Things Going On. The smaller planes are housed in some large hangars at the far end of the field. Biplanes and Formula One share a hangar, since they are so tiny, while the Sport class racers are split between two other hangars. We ended up spending a good amount of time in the Sport hangars, with some of the SARL racers. Alan Crawford flies his Lancair Legacy as Race 21 in the Sport Silver class, along with Ernie Sutter flying another Lancair as Race 66. Jason Rovey flies Race 391, a Vans RV-8, in the Sport Bronze class, with Bob Mills flying his Rocket Six, Race 49. Jason didn't fly on Friday as the Sport class had too many planes, so the slowest four planes took turns in sitting out so that everyone got a turn to fly. However on Saturday he had a very close race with a Glasair and only lost by a nose, in fact from our angle we couldn't tell if he had been beaten or not. The crews were hard at work in all the pits before Sunday's races. Jason had Seth Baker on his crew doing sterling (and secretive!) work for him. Alan had Dave Adams and Bobby Bennett working on his plane. Bobby is an engine master and Dave is a dab hand with fiberglass, so when Alan needed some fairings made for his flap hinges, Dave was on the case. It is hard to tell from one day to the next how much difference a mod makes in speed, with different weather conditions playing a part, but it was generally felt they might be good for an extra mile or two per hour. A cool interlude was when I was asked to come and photograph a gathering of Southwest employees, of which there seemed to be a large number in attendance! They were gathering along with their ex-CEO, Herb Kelleher, who founded the airline way back when. Southwest folks. Herb is in the red ball cap. After a good heat on Saturday, Alan had a very close race on Sunday with a Lancair that he just couldn't squeak past, no matter how hard he tried. And he tried pretty hard! Of course, many people come to Reno to watch the Unlimited aircraft. These are mostly ex-WW2 fighter aircraft, converted for more speed, with clipped wings, bigger engines, sleeker canopies and any other modifications the engineers can come up with. These bad boys will do 450-500mph and sound Awesome. One of the baddest boys out there is Strega, a P-51 Mustang. On the Tuesday of Reno week, the canopy imploded during a qualifying heat and she had to make an emergency landing (the pilot was fine, although I imagine he may have needed a new flight suit). This meant she had to start from the back of the pack after being fixed. Cue Friday's Unlimited Silver race, the first one we saw after arriving. Strega tore through the field like the others had lead bricks in their wings, I have never seen such a trouncing. We didn't discover why until after the race, when we found out the story. Of course, Strega is meant to fly in the Gold class. However, Strega's luck wasn't quite all there - she apparently clipped a pylon in that Friday session, so had to do it all over again on the Saturday! Which she did with the same ease. And then came the Sunday race. Once again, starting from the back of the line, she tore through everyone in Gold as well, apart from the leader - Voodoo, another P-51 - which handily won the race. On Sunday night after the races, they hold a huge banquet as the awards dinner. Alan kindly gave us tickets for it so we were able to join them, which was splendid. After the main awards were done, all the SARL guys and girls that could be found, were rounded up for a group photo on stage. There was, of course, general silliness and more photo taking; if you're curious to see more then head over to my SARL gallery on the SportAirRace.org site. We would certainly love to go back to Reno. Let's hope next year's event is as cool! 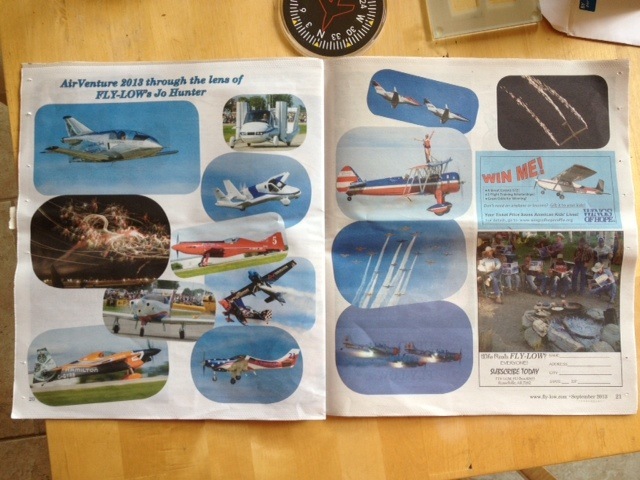 I'm doing the happy dance; I just received September's issue of Fly-Low in the mail, and it's full of my pictures! I attended Oshkosh on a Fly-Low press pass, and this is the fruits of my labour. Although I've been lucky to have had lots of pictures in Fly-Low over the last couple of years - mainly due to the SARL Air Races - this might be the most I've had in a single issue. Enjoy! 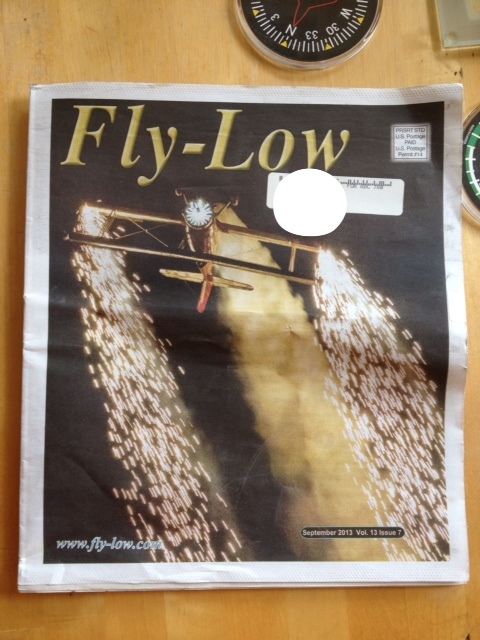 You can download the current issue here: http://www.fly-low.com/current-issue/ - but the PDF here will change each month. The cover, showing Gene Soucy during his night show. 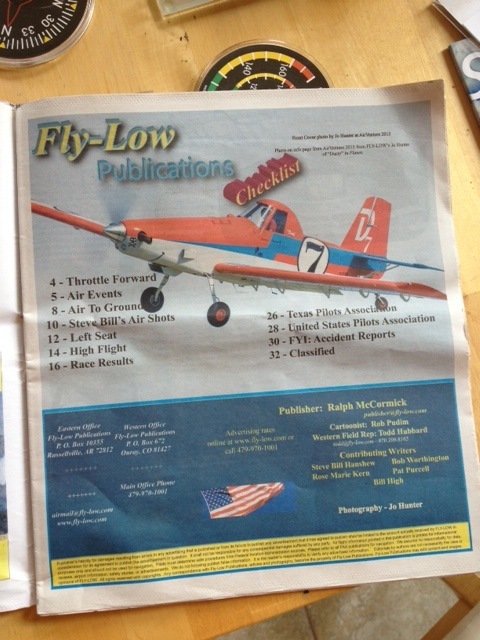 The contents page, with Dusty from 'Planes'. A whole double page spread!